There are serious problems with Louisiana’s 46-member delegation to the Republican National Convention in Cleveland. Businessman Donald Trump won a solid victory in Louisiana’s Presidential Primary on March 5, defeating 13 other candidates. Trump received nearly 42 percent of the vote, while Texas Sen. Ted Cruz received just over 37 percent, Sen. Marco Rubio received 11 percent, Gov. John Kasich six percent, and Dr. Ben Carson two percent. As a result of the popular vote, under state and national party rules, Donald Trump should have received 22 committed delegates to the Republican National Convention in Cleveland, Ted Cruz should have received 19 committed delegates, and no other candidate should have received any delegates. The remaining five delegates from Louisiana should be the three automatic delegates — the state chairman, national committeeman, and national committeewoman — and two uncommitted delegates chosen by the state Republican convention. However, because of a gross violation of national and state Republican delegate selection rules, the Louisiana Republican Party announced that Trump and Cruz had each won 18 delegates and that Marco Rubio had won five delegates. But under the rules, Rubio was not entitled to any delegates. At stake are not only the four delegates Trump has been denied but also control of the Louisiana delegation and with it Louisiana’s two seats on three powerful convention committees — the Rules, Credentials, and Platform committees. Statewide Delegates. A total of 23 delegates were to be chosen as a result of the votes cast statewide in the March 5 Presidential Primary. Under party rules, only candidates who received more than 20 percent of the popular vote were entitled to delegates. 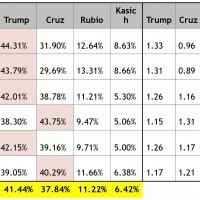 Based on Trump receiving just under 42 percent and Cruz receiving a bit over 37 percent, Trump was awarded 12 of the 23 delegates, while Cruz was awarded 11 of the 23 delegates. There is no dispute between the state party and the Trump campaign over that allocation of these statewide delegates. Congressional Delegates. The dispute arises over who should get the 18 delegates awarded as a result of the Presidential vote at the Congressional level. Three delegates were to be awarded from each of Louisiana’s six Congressional districts. The Republican National Committee’s rules provide that all delegate selection rules had to be in place by October 2015, and such rules could not be amended or changed after that time, in order to prevent changing the rules at the last minute to help or hurt any particular candidate. Louisiana’s rules on Delegate Selection at the Congressional District level are found in Rule 3(D), and they are clear. See box. In other words, in each Congressional District, there are only three delegates, and they must be allocated in proportion to the popular vote. There is no 20 percent threshold. It would be axiomatic that if Candidate A received 42 percent of the vote, Candidate B received 37 percent of the vote, and Candidate C received 11 percent of the vote, then it would certainly not be “proportional” for Candidates A, B, and C to each receive one delegate. Yet, a little before 11 a.m. on Friday, March 4, the State Republican Party – without a meeting of its Executive Committee — purported to adopt a rule, contrary to the RNC’s prohibition on adopting new rules after October 2015, which abrogated the requirement of proportionality and basically said that each of the top three candidates in each Congressional District would get one delegate apiece. had three or four times more votes in each district than Rubio, yet both Trump and Rubio each received one delegate in most Congressional Districts. Under this bizarre rule, even though Trump received nearly 42 percent, Cruz received over 37 percent, and Rubio received 11 percent, the Louisiana Republican Party awarded seven Congressional District delegates to Cruz, six to Trump, and five to Rubio! According to results announced by the state Republican party, Cruz carried two of the state’s six Congressional Districts, while Trump carried four of the six Congressional Districts. For the results reported by the Louisiana Republican Party, see the box on Page 2. One can readily see that the party’s own calculations show that Rubio’s totals in each district are not only less than 1.0 but in every case less than .50. 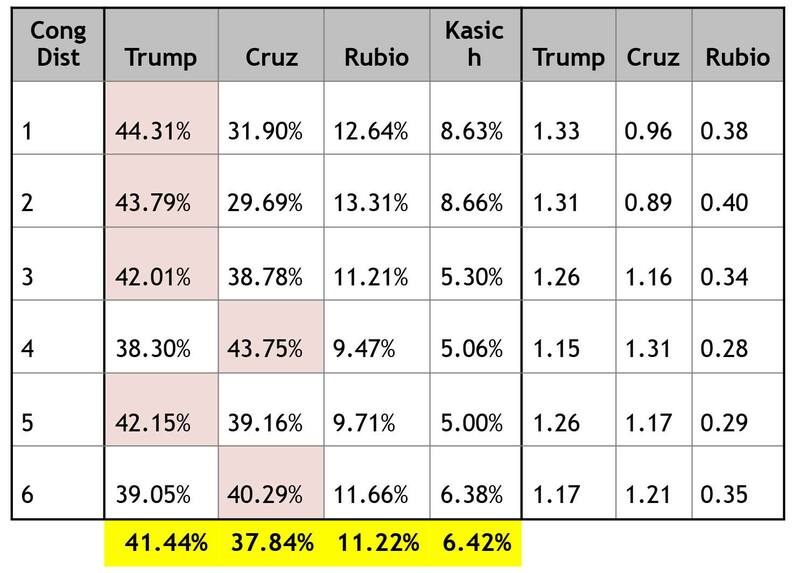 In not a single district could Rubio’s numbers be rounded up to one delegate. It is clear that in the two districts that Cruz carried, Cruz is entitled to two delegates from each, while Trump is entitled to one from each. In the four districts that Trump carried, he is entitled to two delegates from each, while Cruz is entitled to one delegate from each. Rubio did not receive enough votes in any Congressional district to earn a delegate. Amazingly, the purported “rule” that the Louisiana Republican Party issued on Friday morning, March 4, 2016 — after the close of early voting and 20 hours before the polls opened — allowed a Presidential candidate with as little at 9.7 percent of the vote to receive one of the three delegates from a Congressional District. A Bizarre Twist to Party’s Allocation of Delegates. Another problem with the allocation of Congressional delegates by the Louisiana Republican Party is that it used bogus vote totals to allocate delegates at the Congressional District level. In fact, the vote totals represented in the chart on Page 2 are not based on the actual votes cast! The statewide Presidential Primary results announced by the Secretary of State are correct, but the Congressional totals announced by the Louisiana Republican Party are not correct! In fact, they are not the actual returns and cannot be relied on! Here’s what happened: During early voting and absentee voting, there was a huge turnout — nearly 20 percent of all Louisiana Republicans voted. Statewide results showed early voters voted heavily for Donald Trump, much more heavily than on election day. The final results were supposed to be reported by Congressional District, because three delegates were supposed to be allocated to each Presidential candidate in proportion to how Republican voters voted in that Congressional District! But here’s the problem: When Republican voters went to early vote, no record was made of what Congressional District they were in. That was not a problem in a parish such as Livingston Parish, where the entire parish is in one Congressional District. But it was a huge problem in parishes such as East Baton Rouge Parish, which is partly in the Sixth Congressional District and partly in the Second Congressional District. As a result, it is impossible to report the actual vote totals for each Presidential candidate by Congressional District. The returns reported by the Republican Party in the chart on Page 2 were extrapolated from other data! The party took a parish like East Baton Rouge and looked at how many election day voters voted in the Sixth Congressional District and how many election day voters voted in the Second Congressional District. Then they took that percentage and applied it to early voters. So if 80 percent of election day voters in a parish voted in one Congressional District, the party extrapolated that percentage to early voters and assumed that 80 percent of early voters voted in that Congressional district. Simply put, no record exists of what Congressional district people voted in during early voting! We know how early voters voted on a statewide basis but not how they voted by Congressional district. So the election results reported by the Republican Party are not the actual election results by Congressional District! This is wrong on so many levels! You cannot extrapolate votes! You have to report the actual votes or report that it is impossible to report them. This is not a public opinion poll. This election has extremely important consequences. It is an election conducted by the State of Louisiana, and the results have to be accurately reported — the real returns, not some number that has been made up! Furthermore, the exact numbers from each Congressional District are very critical to which Presidential candidate gets delegates. It cannot be a made-up number! Worst of all, the party has not announced that these numbers were estimates, based on a calculation, rather than the actual results. It has left the public and Republican voters with the impression that these were the actual election results, when they were not! The Louisiana Republican Party has deprived Presidential candidate Donald Trump of at least four delegates to which he is entitled under party rules. In addition, by depriving him of his delegates, the party has deprived Donald Trump of the opportunity to secure seats on the Rules, Credentials, and Platform committees. Donald Trump is entitled to seek a remedy to correct the injustice which has been imposed on him and on the more than 124,000 Louisiana Republicans who voted for him for the Republican Presidential nomination. There were a number of other improprieties in the delegate selection process, and Donald Trump has the right to raise those as he considers any challenge to the results.